Topaz Energy and Marine is eyeing expansion into South America in the next two years as the Dubai-based oil services firm looks beyond the current difficulties in the sector caused by the lower oil price, its chief executive told Reuters. Servicing companies are suffering as producers and explorers cut back on costs and capital expenditure to cope with oil prices trading around 45 per cent below their June 2014 peak. Topaz reported an 88 per cent slump in first-quarter net profit, and chief executive Rene Kofod-Olsen expected earnings to continue to be disappointing through the rest of 2015. “The first half has been very tough for all of us and the second half will be moderately better but, I think, everyone in the industry should expect that 2015 will be a bad outlier for the past many years,” he said. Despite this, Topaz, a unit of Oman’s Renaissance Services believes it is in a position to weather the storm and take advantage of opportunities to expand both its fleet and geographical presence beyond the Caspian Sea, the Middle East and West Africa. South America is the main target, according to Kofod-Olsen, with the biggest draw being Mexico, which is opening up its oil industry to more international involvement, and Brazil, where the firm had previously operated but had pulled out because it didn’t have the scale and relationships with Petrobras to make the business work. “We would go in if the working environment normalises and I believe there is a good chance that it will,” he said of Brazil. State-run Petrobras is embroiled in Brazil’s largest ever corruption probe which has seen dozens of high-ranking company officials and politicians questioned over charges including bribery and inflating the value of contracts for personal gain. Topaz is also aiming to expand its subsea division over the next two years in the Atlantic basin, targeting areas of medium depth, Kofod-Olsen said. Having said in November it was in talks to acquire two ships to augment its subsea division for delivery in late-2016, Kofod-Olsen said the firm subsequently renegotiated its deals and would pay significantly less than envisaged as lower oil prices and cut-backs by firms in new orders had given it a better negotiating position. The company has finance to back its plans, having signed a $550 million seven-year loan in April to refinance existing debt at a cheaper rate and to back expansion. 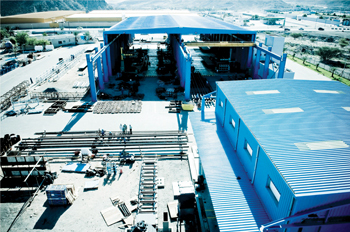 As for merger and acquisition plans, Kofod-Olsen said Topaz was open to opportunities to build its presence in each region.